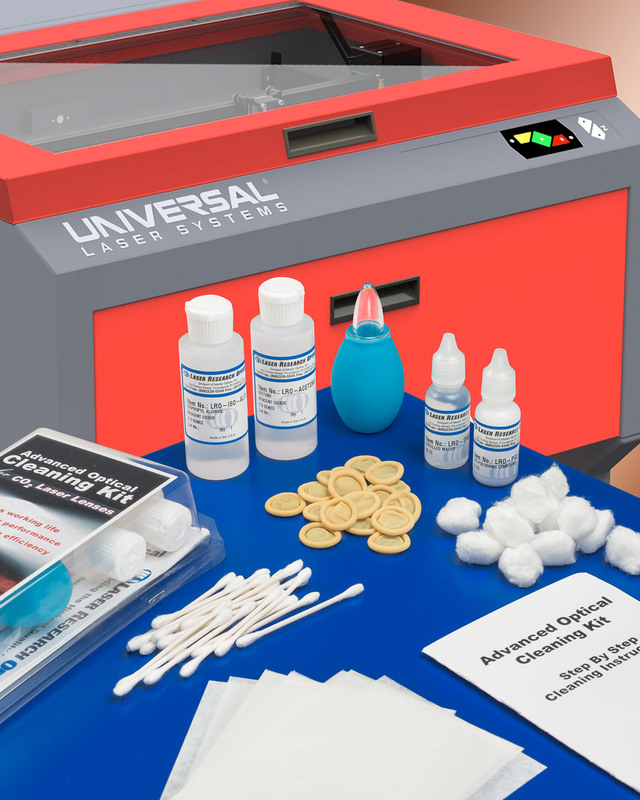 A complete precision optics cleaning kit that includes everything required for technicians to keep laser engraving systems performing optimally is available from Laser Research Optics of Providence, Rhode Island. The LRO Advanced Optical Cleaning Kit provides everything required to clean laser optics including step-by-step instructions, 24 cotton balls, 24 lens mats, 24 surgical-grade finger cots, distilled water, polishing compound, isopropyl alcohol, acetone, and an air bulb for dust removal. The kit is ideal for extending the life of CO2 laser engraving and cutting systems. Developed by an optics manufacturer to remove splatter and blow-back in the field to prevent damage to coatings, extend lens life, and improve the performance of their own CO2 lasers, the LRO Advanced Optical Cleaning Kit is effective for most precision optics such as CaF2, fused silica, germanium, sapphire, silicon, ZnSe, and ZnS. The LRO Advanced Optical Cleaning Kit sells for $39.95 and is available at www.laserresearch.net or by phoning Laser Research Optics at 888-239-5545. Private labeling is also offered.